In a recent interview with Asahi Shimbun, Nintendo President Satoru Iwata confirmed that he wants to release the next Legend of Zelda title for the Nintendo Wii before the end of 2010. The article is in Japanese but it can be viewed by clicking here. While this doesn’t necessarily give an actual release date or confirm that it is going to be released in 2010 for sure… it definitely seems that at this point in time this is the intention of the guys over at Nintendo. This would make it the first console Zelda game in 4 years, which is the same length of time that was between The Wind Waker and Twilight Princess. So far it has been confirmed that Zelda Wii will be utilizing the Wii Motion Plus to provide very interactive sword gameplay. 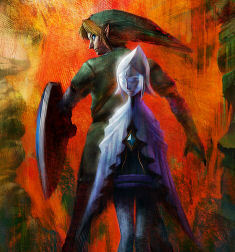 It has been said numerous times that Zelda Wii will be shown at this years E3 Convention in June. With the Legend of Zelda Spirit Tracks beginning to settle down a bit, it is only a matter of time before the hype train is in full motion as we gear towards the official revealing of the next Zelda title for the Wii.